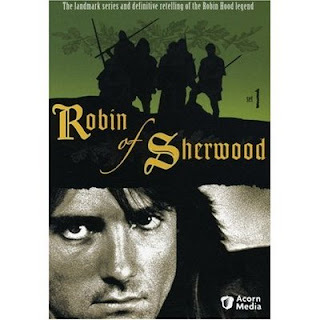 Robin of Sherwood , the BBC version from the mid 1980s, is one of my favorite versions of Robin Hood. Oh, the series has a few drawbacks (bad 1980s hair; some iffy special effects; not a strong enough series story arc); but the good far outweighs that. The good: Michael Praed's strong performance as Robin Hood; a Maid Marian that is no wimp to await rescue; and a mix of realistic history and Celtic mythology and magic that works very well. The original music by Clannad was a perfect pairing of story and music. Ray Winstone adds a rough, threatening edge to the Band of Merry Men. The end of the second season (after just thirteen episodes) took an amazing turn in storytelling, one not often seen in series TV. And for those wondering, yes, it came back for a third season. This version also introduced Nasir, a Saracen warrior, something not found in the traditional retellings. This no doubt influenced the adding of Azeem, the Moor, in Robin Hood: Prince of Thieves (which is worth seeing just for Alan Rickman and the odd directing; clearly half the cast was told to play it seriously, half to go over the top and eat the scenery.) The current BBC version (Robin Hood ) (which I haven't watched) mixes this new trope up with having the Saracen be a woman. Like many others, my love of Robin Hood is founded on the Errol Flynn version (The Adventures of Robin Hood ), which remains my favorite. In terms of humor, you may think of Robin Hood - Men in Tights but I'd love to rewatch When Things Were Rotten, which sadly isn't yet on DVD. Katie is a huge Robin Hood fan. In fact, I recognized that first theme song because she has one season of that series on DVD (bargain price at Best Buy). Should I look into the BBC series for her? Yes! And because it's British, the first 2 seasons are only about 13 episodes; I'm not sure the 3rd season. Robin of Sherwood is without doubt the best version of the Legend to date.